The Pevsner Buildings of England volume on Lancashire describes this eminent Bolton partnership as having a high reputation , building cotton mills, grand houses, non-conformist chapels and public buildings throughout the country, a high point being the rebuilding of the Manchester Royal Exchange in 1921. 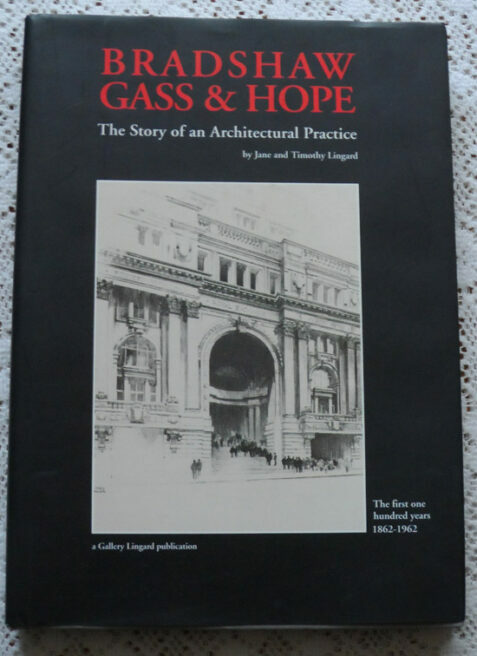 This book tells the history of this practice and is lavishly illustrated, in both colour and black and white, with photographs and examples of beautifully drawn designs and working drawings from the company’s archives. The price-clipped dust wrapper is in near fine condition, clean and bright, with only very minor marks. The binding is square and tight. Inside, the content is clean and fresh and in very fine condition. A lovely copy of a very scarce book.